The Lung Cancer Cause: RADON. We Help Lung Cancer Victims Find the Cause, Radon. Most Americans are unaware that the leading cause of lung cancer for non-smokers is Radon Gas. Radon is a naturally-occurring, invisible, odorless gas that is present in homes throughout the country. LungCancerCause.org is an organization dedicated to creating awareness of this deadly gas. If you, a friend, or loved-one has been diagnosed with lung cancer and are looking for answers as to "why" it happened, we may be able to help. 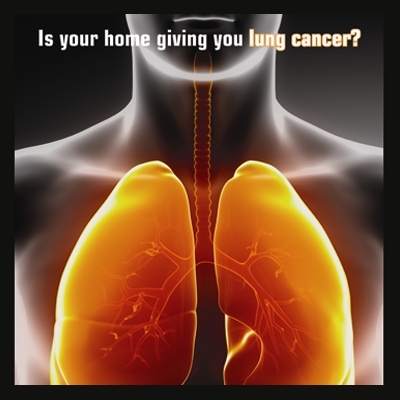 The Lung Cancer Cause offers free radon testing for victims of lung cancer. Contact The Lung Cancer Cause today for more information. It is important to understand the connection between radon and lung cancer. Radioactive radon gas is deadly and can appear in any home. It can cause lung cancer in moderate to high concentrations. Testing is the only way to find the gas since it is invisible and odorless. The risk of cancer is very real. Over 20,000 people die from cancer caused by exposure to the gas each year. You need to understand how radon can cause lung cancer and some of the effects of breathing in the gas over a long period of time. Why Radon Causes Lung Cancer: Radon causes lung cancer because it is radioactive. Specialized testing is the only way to find it. Radon can cause mutations in our cells. This will cause small cell lung cancer over time. The mutated cells will cause a tumor to develop. This mass can begin to grow, replicate and spread until lung cancer develops. Inhaling radioactive particles is the main reason tumors develop. Signs and Symptoms of Lung Cancer: One of the symptoms of lung cancer caused by radon is a new and persistent cough. Another of the signs is if you start coughing up blood. Other symptoms of lung cancer include chest pain and sores on your chest. These symptoms will grow worse as the lung cancer stage increases. The tumors that radon causes can make it hard to breathe. You might also lose weight, get constant headaches and feel bone pain. Lung Cancer Treatment Options: Small cell lung cancer treatment options are the same even if the cause is radon. Surgery is a treatment that attempts to remove the tumors caused by the lung cancer. Chemotherapy is another potential option depending on your prognosis. Radiation therapy can be used even through radioactive radon causes a tumor. A newer treatment for lung cancer is targeted drug therapy that blocks cancer cells from multiplying. Lung Cancer Survival Rates: The survival rates for small cell lung cancer are low especially in late stage patients. The fact radon causes lung cancer does not make a difference. Lung cancer survival rates are around 18 percent over five years. The rates are even lower if you do not get treatment and have a poor prognosis. Your lung cancer symptoms and survival rate will drop if you do not mitigate the radon in your home. The Importance of Mitigation: Knowing radon can cause cancer has led to effective mitigation techniques. Radon mitigation techniques can reduce the radon levels in your home quickly. Radon mitigation limits your exposure to the deadly gas. It can increase survival rates by removing the radioactive particles from the air. You should schedule mitigation before you experience cancer symptoms. Schedule Radon Testing Today: The only way to detect radon is through testing.You should schedule testing today because radon is the most common cause of lung cancer other than smoking. If your test results are above the national threshold, then you need to schedule professional mitigation before you develop cancer and require medical treatment. A test for the gas takes very little time and does not intrude on your lifestyle. If you are concerned about the health of your family, then have your home tested for radon as soon as possible. AND THEIR FAMILIES. CONTACT US TODAY FOR MORE INFORMATION. If you or a loved-one have been diagnosed with lung cancer, there is a possibility that exposure to radon gas in the home or workplace was the cause. We at The Lung Cancer Cause are committed to identifying this problem, helping the victims, and creating awareness to save lives. If you or someone you love are a victim of lung cancer and demand answers, contact us today for FREE radon testing options. If radon has already been identified as the cause of the affliction, we want to hear your story. We may be able to help you fix the problem and prevent future exposure to radon. We are committed to making a difference and your voice can help THE CAUSE. ©2015 The Lung Cancer Cause.